You guys! 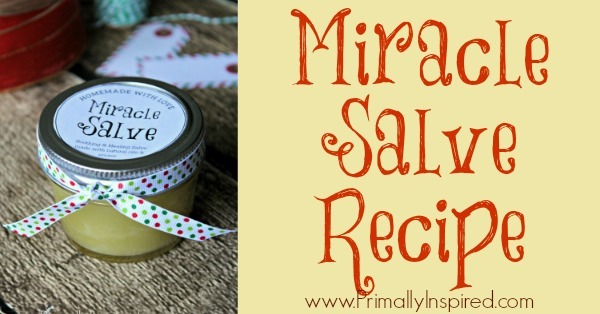 I can’t believe it’s taken me so long to tell you about my homemade miracle salve recipe. I was just making it for Christmas presents and it dawned on me that I never told you about it. What was I thinking?! You need to know about this stuff. This salve is seriously the best. I can’t say enough good things about it. It will soothe and heal the driest of dry, cracked, chapped and scaly skin. It really is like a miracle cream. It’s one of those things you just have to try to believe and then you’ll realize why I’m so crazy about it. My grandmother swears by it. My friend, Danielle says it’s her go to cream to help her kids’s eczema. My husband even loves it for his hands and his face in the winter. He tells me it works really well at protecting his face from windburn when he goes hunting. It works wonders for dry hands and feet. Just rub some on your hands and feet before you go to bed, let the nourishing ingredients work their magic when you are sleeping and you’ll wake up with baby soft skin. It’s that good. 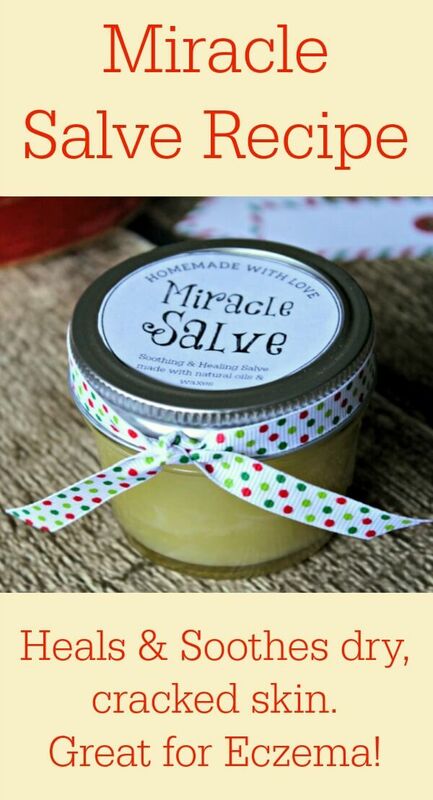 You can use this homemade salve for hands, feet, face, elbows, even lips! Heck, I even use it for my dog’s paws. In the cold, harsh winter months when I need extra moisturizer to combat dry skin, I use it as my nightly face cream – I love this stuff so much! And what’s even cooler is that it’s SO easy to make. You know I don’t do complicated and this recipe couldn’t get more simple to make. You may have to get just one or two ingredients that you don’t have on hand, but I promise you that it will be worth it and those ingredients will last you a really long time. Also, a little of this salve goes a long way so a small jar will last you months. I’m giving you my basic recipe, but you can go as crazy as you want by switching up the oils, adding different essential oils, infusing fresh herbs into your oils, etc. You can’t really screw it up so have fun with this! 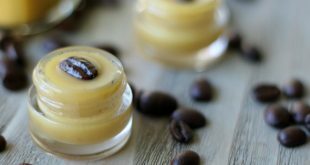 I can’t wait to hear about your salve creations so be sure to leave me a comment if you play around with this recipe. Since this recipe makes the perfect gift, I made some free printable labels for you for extra easy gift giving. Just print and cut the labels out, stick one on a jar (I use THESE jars), tie a bow and your set. Enjoy! optional: 20 drops essential oil of choice (I love using THIS blend - not only is it calming, but it's great for skin health, too) *A specific kid-safe essential oil blend for eczema is THIS. It's been working wonders for a few people that I know that are dealing with eczema & psoriasis. I also reached out to an aromatherapist and she confirmed that this eczema blend was safe for children using this recipe. Add a few inches of water to a skillet and place on your stove at medium low heat. Place a glass jar in the water and add your beeswax to the jar. 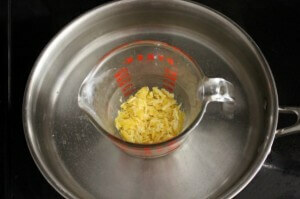 Allow the beeswax to melt - this takes 15 or more minutes. Once the beeswax has melted, add the remaining oils (except essential oil) and cocoa butter or shea butter and let melt - this takes an additional 15 or more minutes. 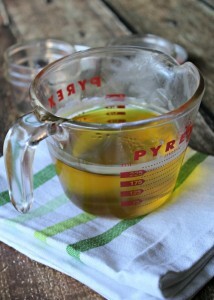 You don't have to stir - the oils will naturally blend together. 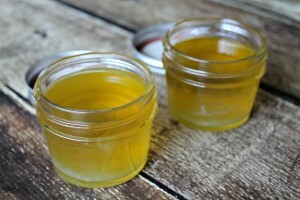 Once everything is melted and liquid, remove the jar from heat and add in your essential oil, if using. Pour liquid into jars of choice (I like using THESE - this recipe fills 2 of those jars) and place on the counter for a few hours to harden. You can speed up the hardening process by placing the jars in the refrigerator for at least a half hour. *You can download the Printable Labels HERE. Nice! This sounds awesome and I love having all the ingredients in my pantry for homemade goodness like this 😉 I will have to add it to my list of DIY ‘crunchy’ Christmas gifts this year. Would it be possible to post the beeswax weight? I have a big hunk of it and was curious how much it actually weighed. Thanks, lady! Oh man! I wish I would have seen your comment before I just made another batch of salve. I don’t have the weight, but will make a note to get it the next time I make it. But! I did run out of my pellets, but found a beeswax bar. Using a sharp knife, I just cut small pieces of the bar off until I filled 3 tablespoons full. Hope you and your adorable family had a great Christmas, Jess!! I have been wanting to use beeswax for some time and seeing as I have everything else this is definitely doable! Great recipe. Great recipe! Is there an alternative to the beeswax? Hi Kenya! Candelilla Wax is a great alternatives to beeswax. It’s harder than beeswax and generally people use about 1/2 as much as they would beeswax. Thanks Kelly, I love this salve. I have been paying $9 for Burts Bees Hand salve. This salve is so much better. It has healed my hands from being cracked from psoriasis. I would like to know what is the best essential oil to use for medicinal purposes. I would also use avocado oil (rather than olive oil) because it works especially well for psoriasis & eczema. You can get a big bottle of avocado oil at Costco very inexpensively (it’s also great to cook with because it has a high smoke point). Other oils that work especially well for psoriasis and eczema besides coconut oil and avocado oil are jojoba and rose hip oil. I played around with my last batch of salve and used a mixture of avocado, jojoba and rose hip oils (to total 1/2 cup) and it turned out so nice! I make a recipe similar to this and I use mango butter and grapeseed oil because they soak into the skin faster. Oh that’s awesome, Danielle! I have some neem oil, too – that’s a great idea as an addition for those with eczema – I will try it! 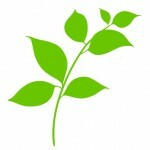 I noticed on the Plant Therapy website, they have a special eczema blend for kids. Would you recommend using that or sticking with the original Anti-eczema if I’m making this to use on my daughter? Hi Katie! I just saw that special eczema helper blend for kids just a few days ago – I was excited to see it! Since it’s a fairly new product, I don’t have any personal experience with it yet. I think I would probably go for the kids blend for young kids if I had the choice. ***Update — I reached out to a certified aromatherapist and she confirmed that either of these recommended eczema blends would be safe for children in this salve recipe. 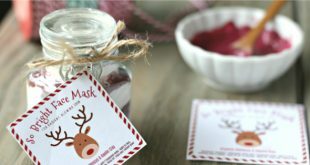 Girl after my own heart making your own beauty products 🙂 We will have to try this one out as my little one’s eczema is kind of back after giving him a few eggs over the holidays (really, what’s Christmas without chocolate pancakes?). Have to have chocolate pancakes, of course 🙂 Thanks, Michelle and hope this helps your little man’s eczema clear up! Thanks, Mary! 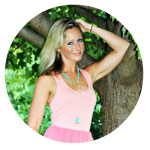 This stuff is the bomb and I totally agree – healing from the inside out is the only way to truly heal it for good! Thanks for your feedback, Cindy! So glad you are enjoying it! I love that you whipped it. I can’t wait to try that! I just started whipping my balm, which seems to be helping the graininess that comes after a few weeks. Awesome tip! Thank you, Amber! This sounds so good want to try it but just wondering would I be able to buy Shea Butter locally. We do have Health shops Here in Australia instead of buying it on line. Or do we have to use the one from Africa? Hi Elbie! Yes you can definitely buy your shea butter locally. I’d much prefer buying locally than having to buy online when I have the choice (I live in the boonies, so unfortunately, I have to buy a lot of my things like this online). 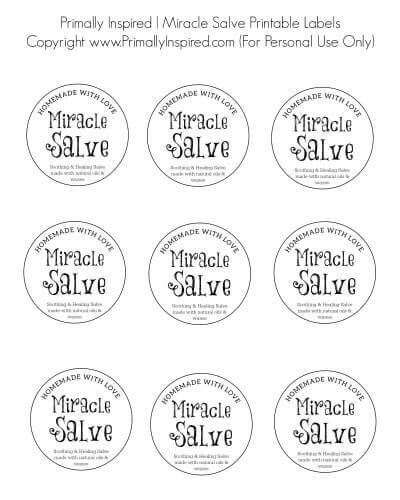 Enjoy this salve!! I made your salve today both kinds with the oils you recommended and was wandering if you can both for the skin , I did find the Avocado oil at Costco but used Olive oil by mistake but finished my last ones with the Avocado oil so got both, I wondered also if you have use arnica for the salves?? Hi Cathy! Yes, both olive and avocado are so nourishing to the skin and face. I haven’t used arnica for the salves yet, but I have used calendula. I love the arnica idea. Were you thinking of infusing some of the avocado and/or olive oil with Arnica flowers? I may have missed this somewhere, but is this safe for around the eye area, especially the eyelids? Hi Holly! I use it all over my eyelids and under eye area and have had no problems. I am so glad I found this! I CAN NOT wait to try it! 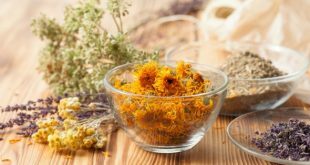 I have psoriasis, and I would much rather try a natural remedy. Thanks for sharing. After I make this I will have to post on my blog. Hi Krystal! Let me know how it works for you! Kelly, How long do you think this salve will last. If I made it now (in April) would it last under Christmas time? Hey Lisa! It has a shelf life of 2+ years so you are good to go! 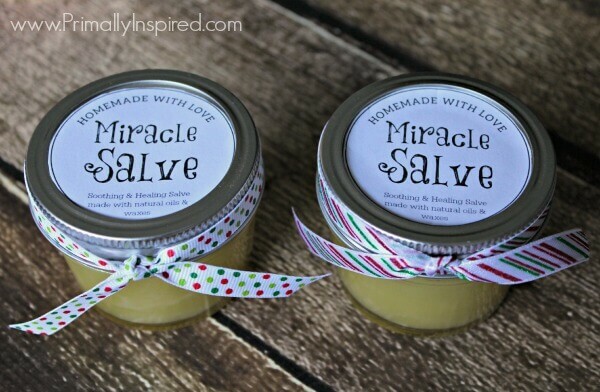 I love salves for so many reasons, but one is because the shelf life is so long. I will try the exema oil blend you suggest. I make solid lotion bars often. I just put the ingredients into a glass Pyrex measuring cup and microwave for 2-3 minutes stopping to stir every minute or so. I found that a micro plane makes it quick and easy to grate bees wax from a larger brick. I also use a small kitchen scale to measure ingredients by weight instead of liquid measurements because the bits of wax and hunks of solid butters are hard to get accurate if you need a specific liquid measurement. Going to make this salve soon. I make a very similar salve. I use calendula infused grapeseed oil in place of coconut though. Hi Stacey! Yes, it’s best to store in a cool, dark place like a drawer or a cabinet. It will last 2+ years! I’m going to make these for a Mother’s Day event. Do you think I could make them “plain” and then bring a selection of essential oils for them to choose and then stir-in at the event? I was thinking of bringing Vanilla, Orange, Lavender, Rosemary… other ideas? and will that work? Thanks! Hey Monique! Love your make and take Mother’s Day event idea – fun!! I think it would be an awesome idea to make this recipe plain and then add in essential oils BUT you’ll definitely need to lessen the amount of beeswax to 2 tablespoons. 2 tablespoons will get you a consistency kind of like vaseline, which is much easier to stir than the 3 tablespoons. The 3 tablespoons gets fairly hard kind of like the consistency of chapstick (but it then melts easily on skin). But the 3 tablespoons would be really hard to stir. I think the essential oils you mentioned are great, although with orange you will sunburn in the sun, so that might not be the best choice (or at least should come with a warning for those who pick it). One of my favorites for skin is geranium – great for anti aging! Mother’s Day follow-up: I used 2-1/2 tablespoons of beeswax to have it a little firmer than “vaseline”, but not as firm as “chapstick”. My first batch was with Shea Butter and I discovered I’m not crazy about the smell. I ran to the store looking for Mango Butter to substitute ~ found yummy smelling Cocoa Butter instead. I added “Vanilla in Jojoba Oil” and put the salve in 1 oz. straight glass jars and added little wooden spatulas. Thanks so much for your suggestions ~ the gifts were a hit! So glad you were able to make it work, Monique! I have tried to download the labels, but I keep getting a ‘404 File not Found’ page. kelly, i really want to try this. my grandson’s eczema is so bad right now he won’t even put on a pair of shorts because his legs look so bad. so do i mix all ingredients plus the essential oil for eczema [last]. Hi Belinda, yes! Make sure to add the essential oil after you’ve removed the other ingredients from the heat. 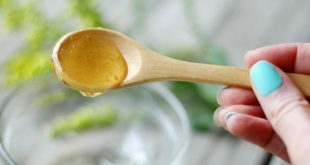 If you don’t want to go through the trouble of making this, you can also just add a few drops of the eczema blend essential oil to a teaspoon or two of avocado oil and rub that on him (no melting – just pour some avocado oil in your hand and add the essential oil then just rub on him — super easy). Do that a few times a day. Avocado oil and the eczema essential oil blend are the 2 ingredients that are most helpful for eczema. Good luck, Belinda. I hope he gets some relief soon! Hello! I’m excited to try this recipe! I was wondering, have you used olive oil in place of the avocado oil? I’m worried about the cost adding up between all the ingredients and wondered if the olive oil is too greasy if used in this recipe. Thank you! Olive oil is great, Christie! I often use it! Great recipe, very easy to make. I also used vitamin E oil in the salve because it will prolong the shelf life of the skin salve as it prevents its oxidation. It’s also a good antioxidant for your skin. How much can you make at one time? Your recipe makes 2 4oz jars. Can you make a larger batch at one time? 10 4oz jars? Thank you! Hi there. Thanks for the fab recipe. I am just beginning in the adventure that is homemade salves, etc. I have made the salve using the recipe given and I am hoping it will help my son with this eczema. Unfortunately I am unable to download the labels – I get an error message. Is there somewhere else I could find them. Hi Jennifer! At this point, you could melt it back down and add more oil to the mixture to get it softer. So needless to say I am making another batch My grandson asks for it to help the patches I like to keep it in the fridge in a wide mouth short mason jar as the coolness also feels good when applying. Carol, thank you so much for taking the time to leave such a helpful and lovely comment! I appreciate it very much!! Sending continued healing blessings to your grandson! I found this recipe via Pinterest, and it has really been a life saver! I made one for my mom and one for my husband and me to share. It’s the only blend that helps my husband’s dry hands. Yesterday, I tried modifying it a bit to make a face moisturizer for myself. I infused jojoba oil and sweet almond with jasmine green tea (I can’t use coconut oil on my face for some reason) and then added it to the melted beeswax and Shea butter. Then I added some lavender essential oil. I let it harden in the fridge and then whipped it with a hand mixer. It’s so creamy and healing! My face feels so happy! Thank you for sharing this lovely recipe! Lori, what a great idea!!! Thank you so much for sharing your tips – I cannot wait to try your face cream idea! Hi, I’m wanting to make this for my mom for Christmas. I picked up some Kokum Butter because of its qualities. I was wondering if I could use it in place of Shea Butter… Hopefully you’ll see this soon! Thanks. Have to tell you this was my first DIY recipe and thanks to you I’m addicted!!! This recipe is amazing! I love it! My husband loves it! My kiddos love it! (including my 3yr old who calls it mommys foot cream!) I’m also now addicted to Plant Therapy (not even sure if I can say that here but I’m gonna 😉!) made it just like you said because I’m a novice and so glad I did! Love it just the way it is!!! Thank you soooo much! My kids have eczema which is what brought me to the search in the first place….very grateful to you for sharing!!! Your comment made my morning, Tammie – thank you so much for taking the time to leave it for me! I’m so happy that you and your family love it just as much as we do! Woohoo! And I’m addicted to Plant Therapy, too – love their oils! Just made it… still cooling. Sounds great, Peggy! I hope this is a winner for your hands! Oh that is wonderful, Peggy! I’m very sorry if I’d missed a response from the other comments, but am I able to use just organic shea butter. I found something online that had just organic shea butter (no from Africa I’m afraid) with Vitamin E oil, can I still use it? Thanks! 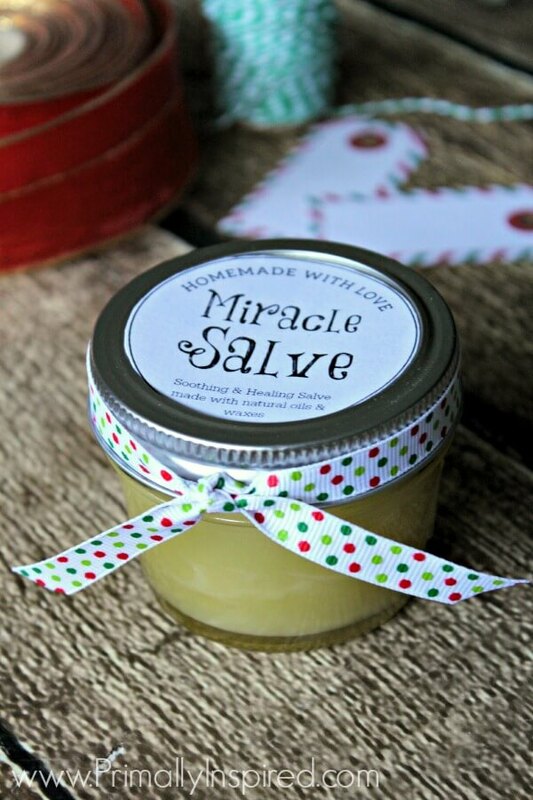 I made this miracle salve for myself and several friends for Christmas presents and it works great on my hands and feet ! I use the labels and that made them look special with a little ribbon and everyone loved it. I also gave them cotton gloves to wear over the salve because I think I used a little too many essential oils and so it was a little oily! You’re right that a little goes a long way but I am about ready to make some more and I think it’ll turn out even better if I’m more careful with the essential oils! Thanks so much for this great idea! So happy to read this, Jeanne! What other essential oils would be good for skin healing? I am planning on making this recipe this weekend! cant wait to try it!! Frankincense is my go-to for skin healing! It’s considered the king of skin healing essential oils 🙂 Geranium is a really great one, too and has a much lighter, but strong floral scent. Lavender is good for just about everything and another great skin healing oil. I know it sounds silly, but when I’m choosing which essential oils to use, I smell the ones that are known to help a condition I’m trying to treat and use the one or ones that call to me the best (or smells the best to me). Our body intuitively knows what we need and it’s always in our best interest to trust that 🙂 I think you’ll love, love, love this salve!!! Have fun making it this weekend and enjoy!